By Nancy Marguerite Anderson August 6, 2016 "The Brigades", "The Pathfinder: A.C. Anderson's Journeys in the West." 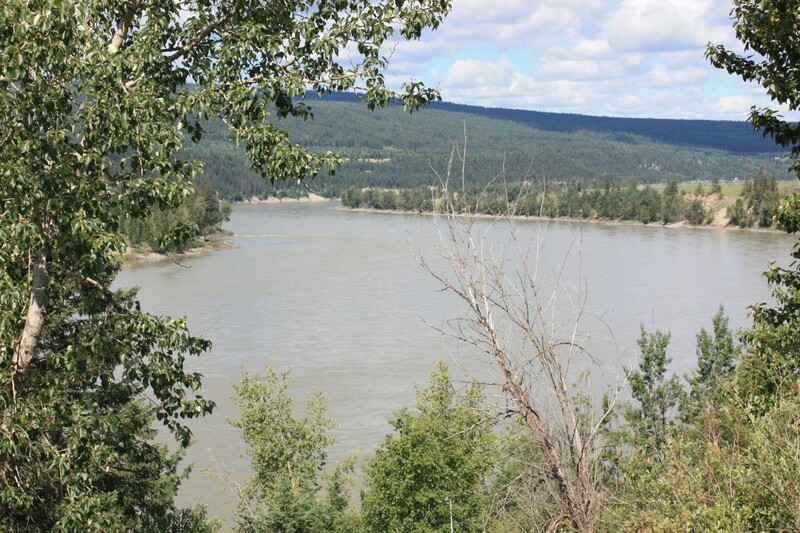 The fort that Anderson arrived at in winter 1842 was on the west bank of the Fraser River, to the left; a few years later, in 18…, he moved Fort Alexandria onto the point of land that sticks out into the river. from the east. “The landslide whereof mention is made, occurred below the fort where the bank was carried bodily into the river completely blocking its course and flooding all the lands adjacent to the river. So sudden was the occurrence that an Indian village was swept away entirely. My recollection is that it occurred at night as I remember my father coming into my room in the early morning wet and his coat, a cotton one, torn beyond recognition, he having torn bandages from it to bind up the wounds of those natives most badly hurt. I do not remember that there was any great loss of life, one or two only I think, but I do remember the story told by my father to the effect that a child who was missing was found after the subsidence of the water, suspended by its clothes in a tree, safe and sound. These land slides called by the French Canadian Les Eboulis were not infrequent on the high banks of the Fraser, but luckily not often of such a serious nature as that I have recorded.” [The Pathfinder, pp. 95-96] [Original source: James Robert Anderson, “Notes and Comments on Early Days and Events in British Columbia, Washington and Oregon,” copy in my possession but two copies in BCA]. Fort Alexandria, as I first have a dim recollection of it, was situated on the flat or bench nearest the Fraser, this is firmly impressed on my memory by the fact that during a summer freshet (or was it on the occasion of a landslide of which I will speak later), that the water rose to such a height, that the fort yard was inundated and therefore in case of further cases of the kind and which might result in loss of life and property, the fort was removed to the upper bench and well I remember getting hold of an axe and proceeding to demolish the apology for a mantelpiece in one of the rooms, in the belief that I was assisting in the general removal. The fort’s regular routine continued through the winter months. Anderson gave the local Dakehl chiefs their usual present of tobacco, and his men enjoyed a holiday and their regale on Christmas Day, as well as drams of liquor on New Year’s Day. As spring  approached, Anderson decided to move Fort Alexandria from its old location on the west bank of the Fraser River, where it was prone to blooding, to a new site on the river’s east side, atop the hill overlooking the Fraser. Thunder showers occasionally. The water attained its height last night, & today has been falling rapidly. About 3 acres of our wheat have been inundated, but if the water withdraws soon we shall perhaps still [save the crop] of [that] portion. Certainly the water has risen higher than many years past, having reached within 3 feet of the fort gate. So the fort was not inundated on this occasion, but sometime later, it seems. By July the water was again rising, and remained so high that the Natives could not set up their weirs. The journal ends halfway through a sentence on July 19th, and the next section begins in the middle of a sentence on September 12. There is no mention of a flood. However, Pere Nobili arrived at Fort Alexandria with the brigade in late August, when he baptized Anderson’s two children, with Donald Manson and Peter Skene Ogden as witnesses. Though James said that the child caught in the tree branches lived through his experience, Nobili said it did not. He must have been at the fort when the landslide occurred, and now I am frantically trying to locate that piece of information. When I do, I will post it here. Updated: In his manuscript History of the Northwest Coast, Alexander Anderson says this: “In 1845 Father Nobili of the Society of Jesuits passed the winter at Alexandria in my company; and the following year he formed an establishment at Talles d’ Epinettes, on the Great Lakes of Okinagan.” (It wasn’t at Talles d’Epinettes, but that doesn’t matter). 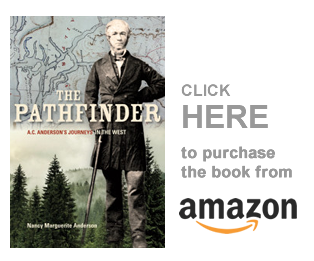 This means that Nobili could have seen the landslide that occurred anytime in the winter of 1845-46.” He arrived at Fort Alexandria with the incoming brigade, and was here on August 31st, 1845, when he baptized Anderson’s children: see page 98 of The Pathfinder. So, it seems, this is when he saw the landslide near Fort Alexandria. There is more information to add in the Fort Alexandria journals, I think, and he might have traveled upriver to Fort St. James with the brigade before returning to Fort Alexandria — which you can find out in the Fort St. James post journals. I think he did, in fact. But at least I have part of the answer, and can find out the rest. I don’t know if you know the feeling of despair and panic, when you know you know something and you cannot find and confirm the information. I am going through every piece of paper I own, and every file, in the hopes I will find this. I will, sooner or later. When I do, I will update this post. In the meantime, I have work to do. Copyright, Nancy Marguerite Anderson, 2016, All rights reserved.